Storing solar energy as carbon monoxide; sugar-powered robots; perovskite solar cell stability. A team at Indiana University engineered a molecule that collects and stores solar energy without solar panels. The molecule uses light or electricity to convert the greenhouse gas carbon dioxide into carbon monoxide more efficiently than any other method of carbon reduction. Burning fuel such as carbon monoxide produces carbon dioxide and releases energy. Turning carbon dioxide back into fuel requires at least the same amount of energy. The team’s goal was to find a method that reduces the amount of energy required to drive the formation of carbon monoxide. The molecule, a nanographene-rhenium complex connected via the organic compound bipyridine, triggers a highly efficient reaction that converts carbon dioxide to carbon monoxide. Essentially, Li said, the molecule acts as a two-part system: a nanographene “energy collector” that absorbs a large portion of the visible light spectrum and an atomic rhenium “engine” that produces carbon monoxide. The energy collector drives a flow of electrons to the rhenium atom, which repeatedly binds and converts the normally stable carbon dioxide to carbon monoxide. The team plans to make the molecule more powerful, including making it last longer and survive in a non-liquid form, since solid catalysts are easier to use in the real world. They are also working to replace the rhenium atom in the molecule, a rare element, with manganese, a more common and less expensive metal. Engineers at MIT, the Technical University of Denmark, and Cornell University designed a microfluidic device they call a “tree-on-a-chip,” which mimics the pumping mechanism of trees and plants. Like its natural counterparts, the chip operates passively, requiring no moving parts or external pumps. 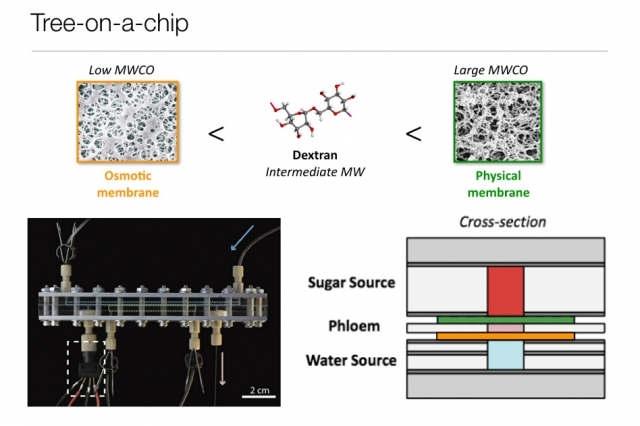 It is able to pump water and sugars through the chip at a steady flow rate for several days. Plants are constantly pulling water up from their roots to the topmost leaves, and pumping sugars produced by their leaves back down to the roots. This constant stream of nutrients is shuttled through a system of tissues called xylem and phloem, which are packed together in woody, parallel conduits. With this setup, the chip was able to passively pump water from the tank through the chip and out into a beaker, at a constant flow rate for several days, as opposed to previous designs that only pumped for several minutes. Anette “Peko” Hosoi, professor and associate department head for operations in MIT’s Department of Mechanical Engineering, said the chip’s passive pumping may be leveraged as a simple hydraulic actuator for small robots. Engineers have found it difficult and expensive to make tiny, movable parts and pumps to power complex movements in small robots. The team’s new pumping mechanism may enable robots whose motions are propelled by inexpensive, sugar-powered pumps. Researchers from Aalto University, Uppsala University, and École Polytechnique Fédérale de Lausanne (EPFL) improved the long term stability of perovskite solar cells using “random network” nanotube films, films composed of single-walled carbon nanotubes. Perovskite solar cells are promising for their ability to capture light efficiently and conduct well, but the lifetime of solar cells made of metalorganic perovskites has proven to be very short compared to cells made of silicon. “In a traditional perovskite solar cell, the hole conductor layer consists of organic material and, on top of it, a thin layer of gold that easily starts to disintegrate and diffuse through the whole solar cell structure. We replaced the gold and also part of the organic material with films made of carbon nanotubes and achieved good cell stability in 60 degrees and full one sun illumination conditions,” explained Kerttu Aitola, a researcher at Uppsala University. In the study, thick black films with conductivity as high as possible were used in the back contact of the solar cell where light does not need to get through. According to Aitola, nanotube films can also be made transparent and thin, which would make it possible to use them as the front contact of the cell, which lets light through. Additionally, nanotube films provide superior flexibility compared to the conductive plastic flexible solar cells are currently manufactured on. The researchers conducted a 140 hour experiment, during which traditional perovskite cells with gold electrodes experienced a dramatic, irreversible efficiency loss, rendering them effectively nonoperational. 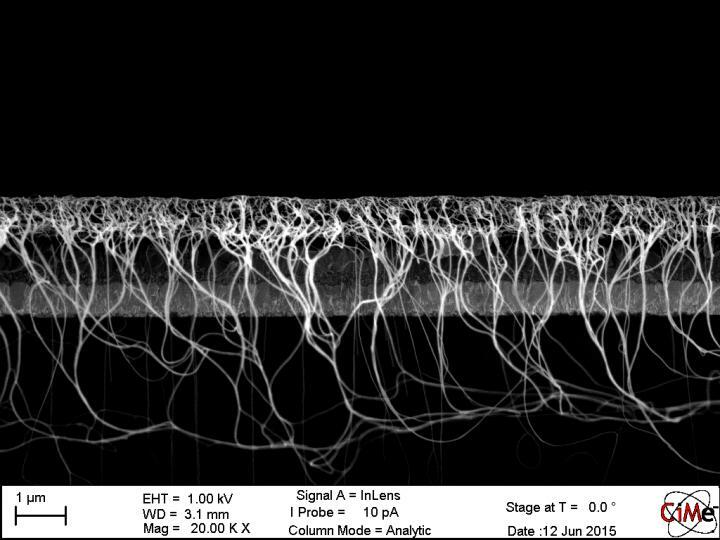 The nanotube cells showed only a small linear efficiency loss, but with a lifetime the team extrapolated to 580 hours, there’s still a long ways to go to catch up to the 20-30 year lifetime of silicon solar cells.